Have you ever shot several amazing video clips on your iPhone and now you want to transfer them to your Mac without any quality loss? Or you want to edit your great iPhone videos in iMovie on your Mac? You may be looking for the best yet most convenient way to get videos captured on your iPhone over to the Mac. Sending through email or iMessage seems to be a good choice, but it won't transfer the video at the original resolution. Using the iOS built-in sharing tools to send a movie from iPhone to Mac isn't a very ideal option either, as the quality will get reduced from the high quality HD 720p video to a very low resolution for bandwidth conservation reasons. Take it easy! You can download Wireless Transfer App to help you. This $1.99 iOS app is specially developed to resolve the file transfer issues among Apple devices (iPad, iPhone, iPod) and between Apple device and Mac or Windows PC. It will definitely help you to transfer videos from iPhone to Mac. Using Wireless Transfer App to get iPhone videos over to Mac, you don't need to worry about any quality loss during the transfer. Besides, you never need to use iTunes sync or cable. It only requires that you have your iPhone and your Mac connected to the same Wi-Fi network. 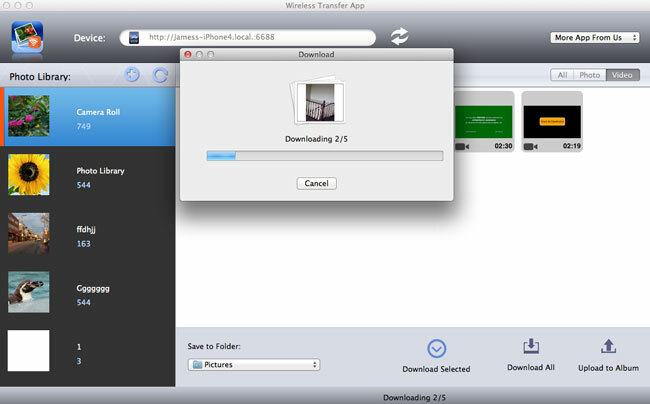 Now let me demonstrate how to transfer video from iPhone to Mac using Wireless Transfer App. Note: Make sure your iPhone and your Mac are connected to the same network. 2. 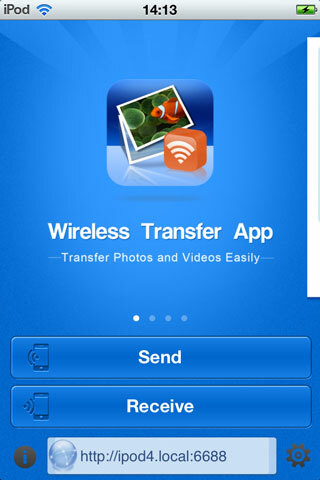 Run Wireless Transfer App on both iPhone and Mac. 3. In the Mac app, detect your iPhone device. The photos and videos in your iPhone will be listed in the Mac app. 4. Switch to the Video tab and choose the videos you want to download to your Mac. 5. Download the selected videos to a folder in your Mac. Note: You can create a new folder first. P.S. If you don't want to install Wireless Transfer App on your Mac, you can also choose to open a web browser in your Mac and enter the http address as shown in the iPhone app to get your iPhone videos started transferring to your Mac. Of course, in order to transfer iPhone videos to Mac, you can also connect the iPhone to your Mac and copy over the movies manually. Mac users can also use Preview, iMovie, and even iPhoto to transfer the video over. However, using any of these applications to transfer videos, you need to connect your iPhone to your Mac via USB cable. The Wireless Transfer App lets you download iPhone videos to Mac wirelessly and instantly, with no need for cable, iTunes sync or Apple ID. Copyright © 2016 WirelessTransferApp.COM, All Rights Reserved.